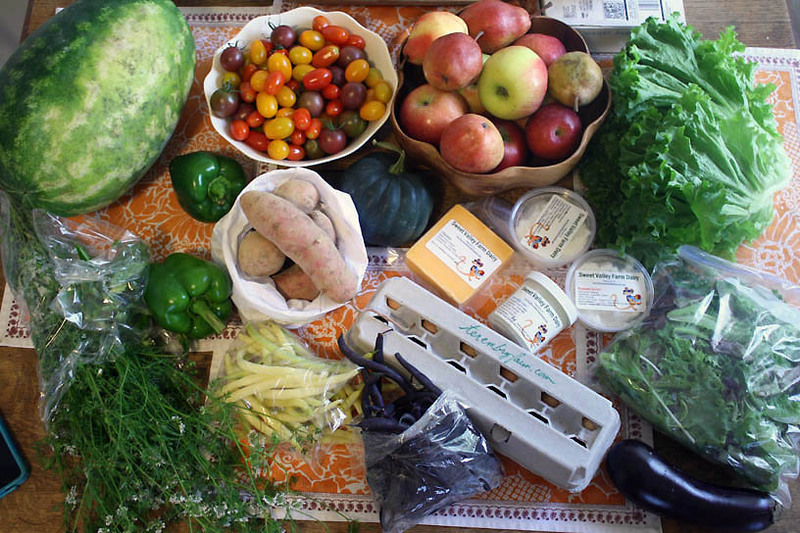 I wasn’t the only one trying to cling to summer (despite having a bag full of apples, pears and acorn squash from Clyde), and one woman said that her kids would eat the tomatoes like candy. 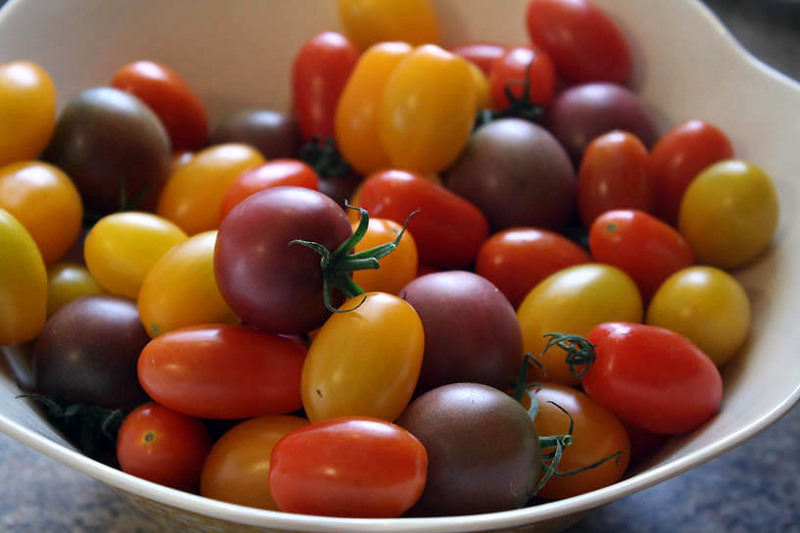 That’s encouraging to hear–especially since I didn’t like tomatoes until a few years back, despite promising my mother, at the age of three, “I’ll like tomatoes when I’m four!” It’s a running joke in my family, but now, when tomatoes are good, they’re GOOD. And the rest of the year, they’re best avoided. Three pints for $5 seemed a steal, and they’ll find their way into all my meals this week, along with the giant bags of beans in my next-to-last CSA box. I’ve shared a recipe in the past that uses both ingredients, a green bean salad with tomatoes and goat cheese. That’ll probably be tomorrow’s lunch. 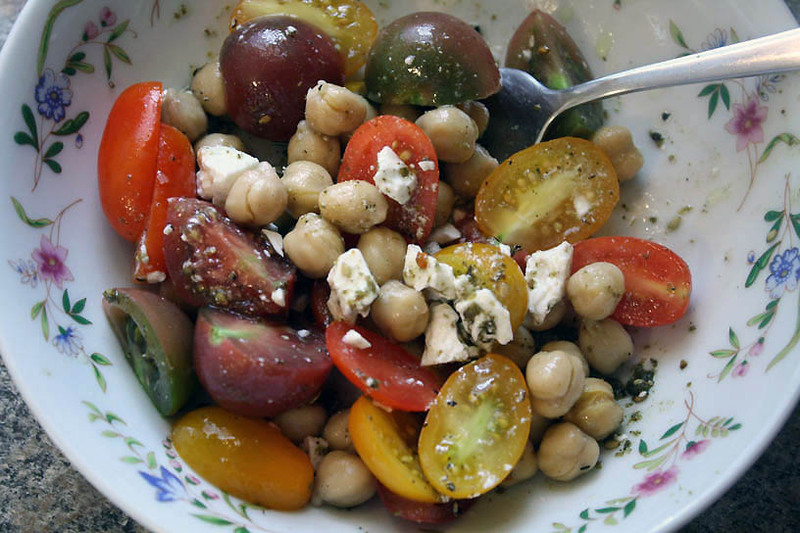 Today, it’s another simple and flavorful salad that combines chickpeas with feta and za’atar, a Middle Eastern spice. If you’re not familiar with the blend, popular blogger and cookbook author David Lebovitz wrote about a visit to a za’atar farm in Lebanon recently; it’s a fascinating read. 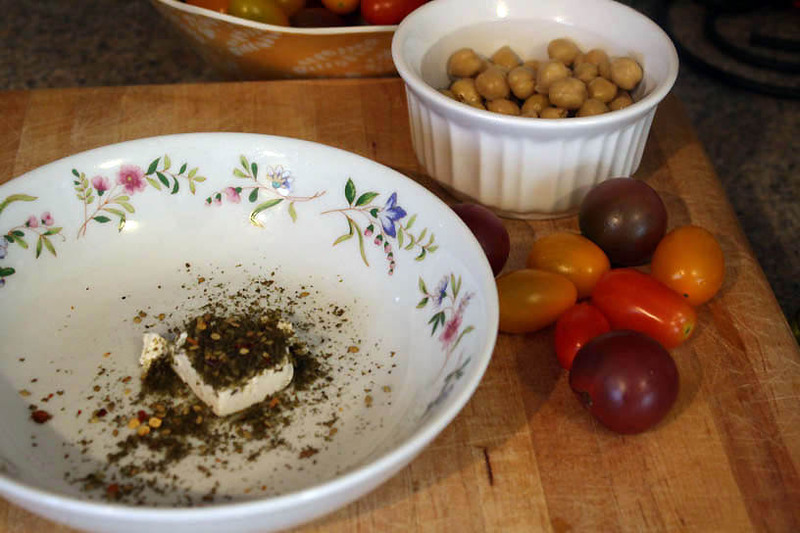 In a small bowl, mix together the feta, za’atar and crushed red pepper flakes. Add 1 Tbs. of the oil and let sit while you prepare the rest of the salad. Put the tomatoes in a large bowl. Stir in the chickpeas and season with 1/4 tsp. salt and a few grinds black pepper. Add the remaining 2 Tbs. oil and the vinegar. Stir in the feta, season to taste with salt and pepper, and serve. That looks good! I’m also trying to find new ways to cook eggplant (one left from this week’s CSA!) so maybe I’ll try it with za’atar too. I have been loving za’atar recently too. Only just discovered it. This salad sounds delish. Thanks for sharing the link to the DL post…reading now. Hope all is well!